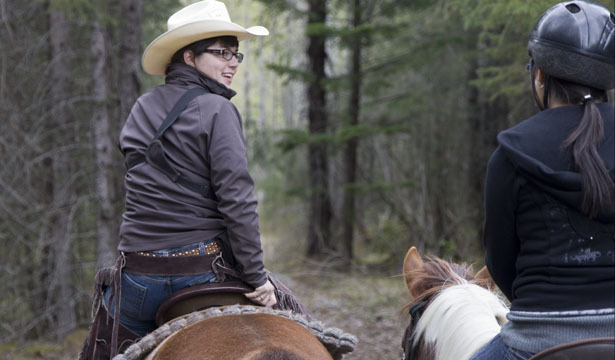 This Skagway Tour if for people who love horseback riding, and have a passion for the outdoors. Your ride will take place in Dyea, just a short ride from Skagway. Once outfitted with your horse companion, we will make our way as a group through lush temporate rainforest before reaching the vast scenic expanse of the Dyea tidal flats. In this area, wildlife abounds and we commonly see eagles, otters, migratory birds, and the occasional bear. During the peak of summer, salmon running upstream to spawn are so thick that they can be spotted everywhere along the creek that flows throughout the flats. A snack of salmon pate' adn beverage is included. Round-trip transportation providedand all riders must weigh less than 250 lbs. and at least 4’10” tall. Any personal physical restrictions must be announced, for safety purposes, and it is recommended that you be in good physical condition. Riders of all skill levels can be accomodated.